Frozen yogurt offers ice cream lovers an alternative way to enjoy a frozen dairy treat, without the high fat content of ice cream. 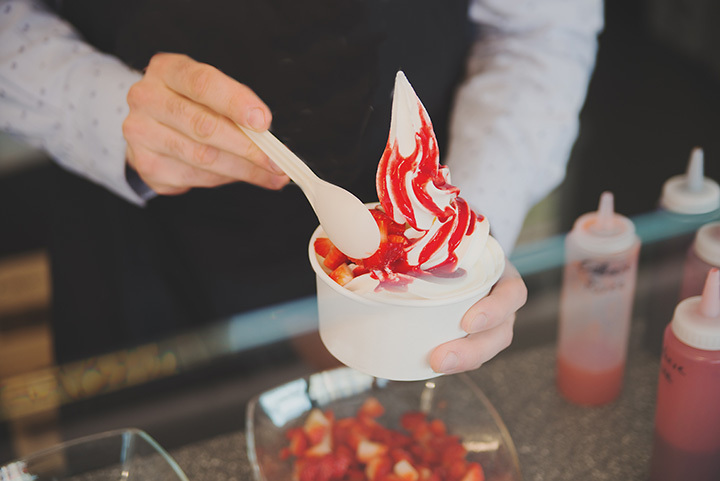 Whether you enjoy yours plain in a cup or cone, or prefer to load it up with a variety of delicious toppings, you’ll love these frozen yogurt places in Maine. Beals Ice Cream makes their own frozen yogurt, and it’s a favorite among countless customers. Chocolate peanut butter and heath bar are among their best-selling flavors. Mainely Custard is a hot spot for frozen yogurt during the summer months. Located in Freeport—home of outlet shopping mania—it’s the perfect place to cool off when a shopping break is required. They are open from early June through the fall months. The homemade ice cream and frozen yogurt at Mt. Desert Island Ice Cream Company are made in small batches—no more than five gallons at a time. This ensures you’re enjoying the creamiest, most flavorful product available. Set to open for the season in late May, Scoop Deck is a favorite of tourists and locals in this Maine beach town. Get your frozen yogurt early in the evening on weekend summer nights, as the line is typically long later in the evening. Specializing in frozen yogurt, Cherries on Top serves the ice cream lover, too. Enjoy frozen yogurt that doesn’t come from a machine. Instead this yogurt is akin to “hard ice cream,” and is as rich and creamy as you’ll find. Open seasonally, Ice Cream Dugout is a fan favorite in this Maine community. Serving up Shain’s of Maine frozen yogurt and ice cream, you’ll enjoy a local treat when you stop here. Current frozen yogurt flavors include black raspberry chip, chocolate, and coffee heath bar. Opening for the season in May, Udder Heaven is the home of dairy experts. Everything they serve is made from local milk. That includes their frozen yogurt, which is rich, creamy and delicious. Last season’s flavors included vanilla and black raspberry chip. Serving up both hard and soft frozen yogurt, Mrs. & Me is a southern Maine staple. Located on a corner adjacent to the Route 1 strip of outlet malls, it’s been in business for decades. You’re not likely to find any better frozen yogurt—or ice cream, for that matter—than you’ll find here. Enjoy “Two for Tuesday” at Sweet Frog Premium Yogurt. Order two cups, two cones or even two giant waffle cones of your favorite flavor. Try blue cotton candy for a unique flavor. You’ll love the many, many toppings available.